-Robert Kraynak, in Leo Strauss and His Catholic Readers, 2018. -Ralph Hancock, in Leo Strauss and His Catholic Readers, 2018. 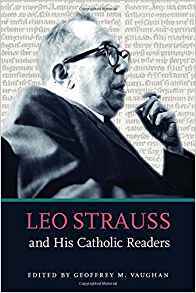 The publication of this book on Leo Strauss and political philosophy by the Catholic University of America Press is a manifestation of the Catholic Mind at its best. In dealing with Leo Strauss, a man of formidable insight and thorough scholarship, we need to know the Hebrew Bible and the various schools of Jewish thought. We need to know how Islam with its thinkers is related to Jerusalem. We also need to know modern philosophy—Machiavelli, Hobbes, Locke, Spinoza, Kant, Hegel, Marx, Nietzsche, Husserl, Heidegger, and Kojève, as well as St. Thomas and the dimensions of Christian revelation in both its Catholic and Protestant traditions. Above all, Strauss takes us back to Plato and Aristotle as well as to the Epicurean post-Aristotelians. These latter—the Stoics, the Epicureans, the Cynics–are often neglected. Father Charles N. R. McCoy, one of the most penetrating commentators on Strass, taught us much about the relation of modern thought, not just to Plato and Aristotle, but to the post-Aristotelians, Bradley Lewis’s chapter on McCoy, sometime chairman of the politics department at Catholic University, is most insightful. Of all the Catholic commentators on Strauss, McCoy’s is the one that is most respectful of Strauss, while, at the same time, the one that is most critical of the completeness of Strauss’ political philosophy. McCoy always seemed to me, as one of his students, to be the one thinker most conscious of the negative effect on Strauss’ thinking caused by his respect for but hands off attitude to particularly the Catholic view of revelation. Leo Strauss (d. 1973) was a German Jewish scholar who came to the United States, as did many others, including Catholics like Jacques Maritain and Heinrich Rommen, because of the turmoil of World War II Europe. He became a professor of political philosophy at the University of Chicago. In that capacity, through a series of some fifteen dense, tightly argued books, Strauss took the measure of what he called “the modern project” and found it lacking. Strauss is sometimes, at a stretch, said to the father of neo-conservatism. He is certainly, along with Eric Voegelin, responsible for the revival of study of the whole western tradition, especially its beginnings and their pertinence to today’s political and moral problems. Strauss’s books like The City and Man, What Is Political Philosophy?, Thoughts on Machiavelli, and Natural Right and History need to be read and re-read. Readers of Strauss know of the East Coast and the West Coast Straussians. These schools, as it were, follow the path of the many students who were students of Strauss. Perhaps the most famous are Allan Bloom, whose commentary on Plato’s Republic and Closing of the American Mind are rightly held in high esteem and Harry Jaffa, himself a man of remarkable energy. Jaffa represented, at the Claremont Graduate School, a Strauss more concerned with statesmanship than metaphysics. Lincoln and Churchill were often studied in the light of Thucydides and Plato. This book was edited by Goeffrey Vaughan at Assumption College. Assumption was the original home of Father Ernest Fortin, A. A. Fortin later became the chairman of the theology department at Boston College. Fortin was certainly the most well-known Catholic commentator on Strauss. Some thought him “too Straussian”; others thought him just about on target. The chapter on Fortin and Strauss, written by Douglas Kries at Gonzaga University, is most valuable. Fortin was very critical of what came to be known as “Catholic Social Thought” with its often uncritical acceptance of modern “human rights” as if that phrase had no ideological overtones. One can say, without too much exaggeration, that, except for Benedict XVI, Catholic Social Thought had little idea of what political philosophy was really about. It seemed to accept value-free sociology as if that too were a neutral discipline in lieu of a serious understanding of political philosophy and its relation to revelation and philosophy itself. Reading Pope Francis’ encyclical and exhortation is almost like reading everything that Fortin worried about. “Fortin’s concern was rather to engage a number of medievalist scholars, especially Catholic ones, who were arguing and had been arguing for some decades that the transition from the natural law of Thomas Aquinas and his followers to modern natural rights or human rights was one of continuity rather than discontinuity,” Kries wrote. “These scholars, according to Fortin, had run together premodern thinking with modern thought, teleological thinking with non-teleological thinking, natural law wit natural rights.” The obvious result of this confusion was to find that upholding the natural rights of the unborn ran smack up against the claim and practice of the civil law in many countries that abortion was a “human right”. A careful reading of Hobbes would explain why this confusion was possible. The book is divided into three general parts: 1) the issue of natural rights, 2) Strauss’ relation to Catholic concerns, and 3) Strauss’ understanding of Christianity, politics, and philosophy. In the first section, in addition to Kraynak, Lewis, and Kries, Geoffrey Vaughn writes on Strauss and the natural law, while Marc Guerra relates Strauss to the thought of Benedict XVI especially on the relation of modernity and our understanding of creation. “To believe in the primacy of Logos, Benedict explains, is to believe in ‘the primacy of the particular’, rather than the universal. Yet it is also to believe in the ‘primacy of freedom as against the primacy of cosmic necessity,’” Guerra writes. “Catholicism argues that we live in a world that is created, sustained, and governed by a God who both stands outside the world and enters into the world he created. Such a God revealed himself both as ‘I am’ and as ‘the god of Abraham, Isaac, and Jacob; and he freely acts out of love for his creation . . .
Gladden Pippin’s essay comes to grips with three thinkers—d’Entrèves, McCoy, and Yves Simon—who considered the issues of classical thought in a way that found Strauss helpful but not definitive. “D’Entrèves, McCoy, and Simon highlight the same changed relationships between philosophy and society that Strauss noticed, but with a greater focus on the effects of that change on the ordinary citizen of modern politics.” Like the classical authors, Strauss was often accused of elitism. But the question of what to do with the aristocrats was already found in Aristotle and in the American founders. The whole hypothesis of the mixed regime centered on the rightful place of experience and knowledge in any polity. Carson Holloway’s chapter on how to reconcile Strauss and Catholicism, along with Gary Glenn’s fascinating chapter on what Catholics might learn about Catholicism from reading Strauss, deserves much attention. Brian’ Benestad’s analysis of historicism serves the vital function of spelling out the implications of this most widespread issue, one that Strauss treated with great care. The three essays on Strauss and Christianity by Giulio De Ligio, James Stoner, and Ralph Hancock respectively take us to the theoretical roots that separate Strauss from Catholic thinkers but which, at the same time, show how what they have in common represents a great area for future studies in political philosophy. This well-presented book brings us to the central issue that the work of Strauss leaves Catholics with, namely how are classical thought, revelation, both Jewish and Christian, able to exist together in a coherent, non-contradictory whole that, in its truth, illuminates modern thought and politics in terms of ultimate things. This is, as I say, scholarship at its best. Ralph Hancock, “Leo Strauss’s Profound and Fragile Critique of Christianity,” ibid, 318. Marc Guerra, “Modernity, Creation, and Catholicism: Leo Strauss and Benedict XVI,” ibid, 114-15. Gladden Pappin, “The Mutual Concerns of Strauss and His Catholic Contemporaries: D’Entrèves, McCoy, and Simon,” ibid, 165. Philippe Bénéton, “Strauss and Pascal: Is Discussion Possible?” ibid, 298. James Stoner, “Aristotelian Metaphysics and Modern Science: Leo Strauss on What Nature Is,” ibis, 279. This was originally published with the same title in Crisis Magazine on August 31, 2018.